Electronic identification (EID) systems consist of a transponder, a reader and a data processing unit. Coded signals are sent by radio frequency or infrared light between the components of the system. The information in this section focuses on radio frequency (RFID) forms of electronic identification and is intended to support a farmer’s own research on commercially available products. Product reliability and the how they integrate with various control systems varies widely. Improving work efficiency. By reducing the labour required for identifying cows; eliminating human error associated with ear tag reading; producing valuable management information and reducing the amount of animal handling. Simplifying collection of data. 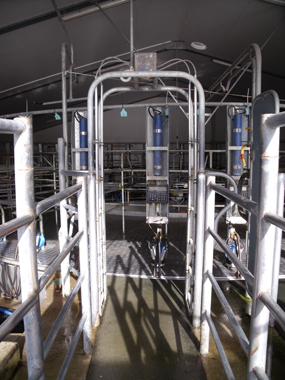 EID systems can be linked to dairy management software which can collect information from milk metering systems, walk-over weighers etc, providing ease of management and information for decision making. Typically there are three elements to the identification system: a transponder (ear tag, leg band, neck pendant, implant or rumen bolus); a reader (transceiver); and a data processing unit (e.g. laptop or handheld). 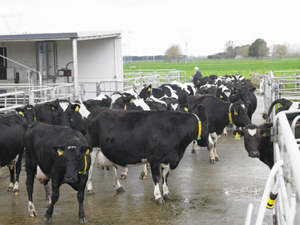 Most electronic cow identification systems used in New Zealand use radio signals to transfer the information from tag to reader (RFID). These systems have the advantage of being able to work in dirty, dusty and moist environments and do not require line of sight. Software and databases link EID codes to animals, store that information, and enable decision making and data sharing. Data may be managed locally or transferred to third party databases. When linked to management databases, EID can integrate with computerised management systems that can record the information and then use it to carry out many management tasks automatically. When purchasing an EID system make sure you have a list of all the management tasks that you want it to link with, and that the complete system is capable of delivering these. Despite standards, not all tags, readers, and software are compatible, unless they have been purchased from the same supplier. Check for compatibility before committing to a purchase. Future-proof any system that you invest in. Any system being considered needs to be around and fully supported for the foreseeable future. Make sure that any system you are considering purchasing is compatible with any existing or proposed national identification schemes which use or will use electronic identification. real time identification of cows that need special attention (e.g. cows on heat, 3 titters, animal health checks or treatment etc).